Bob Mitchell - Heritage Funeral Homes Inc.
of R.R. 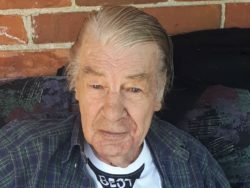 # 4 Arthur, Ontario passed away at home surrounded by the love of his family on Sunday January 27, 2019 in his 83rd year. Cherished husband of the late Barbara (Darroch) Mitchell for 49 years. Dear father of Christine and John Lenselink of Palmerston, Dalton Mitchell of Arthur, Jean and Albert Kienapple of Arthur, Bernice Mitchell of Mount Forest, Earl and Vanessa Mitchell of Harriston, Ken Mitchell of Arthur, Annie Mitchell of Arthur and Wayne and Lindsay Mitchell of Harriston. Grandfather to his 31 grandchildren and 9 great grandchildren. Brother-in-law of Jack and Margaret Darroch, Donna Rudow, Alvin Darroch, Raymond and Connie Darroch, Sheila and Albert Subject, Cathy and Dave Smith, Bonnie and Fred Wocks, Roxanne and Greg Bowman, Phyllis and Ted Smith, Diane Darroch, Douglas Gowing and John Herrfort. Fondly remembered by his many nieces, nephews and friends. Predeceased by two granddaughters Hayley and Keria, his parents Dalton and Alma (Schieck) Mitchell, brothers-in-law and sisters-n-law, Gordon Darroch, Shirley Darroch, Eleanora Larson, Shally Ernest, Lynda Gowing and Donelda Herrfort. To honour Bob’s wishes cremation has taken place and there will be a service of remembrance for Bob and Barbara at a later date and will be announced at that time. Arrangements entrusted to the Crawford Funeral Chapel, Arthur.